Cherry Quartz is a gemstone with meaning and properties of getting hope. It can get rid of anxiety of the future. It would open up the door of possibility and create new future. This gemstone is useful when you want vitality or courage to make progress. 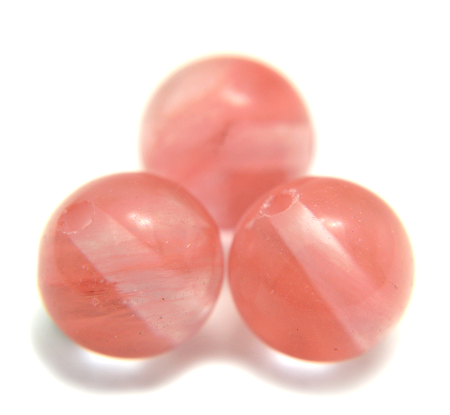 Cherry Quartz is a gemstone that can make you receive invisible energy easier. It is good to use when you want to make your vision of the future clear. It would read your flow of luck and lead you to the best way. This gemstone is popular among fortune tellers or therapists. Cherry Quartz is an artificial gemstone (glass). It is mainly used to support other gemstones. Although it is an artificial gemstone, you can have the power of its color. The meanings and the properties of Cherry Quartz are mostly from the color. You can receive the energetic power which pink and red colors have. As its name shows, Cherry Quartz is a gemstone that symbolizes cherry. It is very popular kind of fruit for fatigue recovery. Because of that, it is now recognized as a healing gemstone. Cherry Quartz is known as an amulet to reduce nervousness or anxiety. This gemstone also can be used to heal the trauma in the past. Cherry Quartz is a gemstone with a pink color. It has very beautiful color and high transparency together. It is often made into bracelets. This gemstone is sold in fairly reasonable price, but not many shops have it. You can't buy it in gemstone shops that only have natural gemstones, so please be careful. Also, Strawberry Quartz and Cherry Quartz is often mistakenly sold. Cherry Quartz is an artificial gemstone, but Strawberry Quartz is a natural gemstone. They are totally different gemstones and the prices are very different too, so please check them carefully. Cherry Quartz is a gemstone with meaning and properties of purifying energy. It will absorb negative energy, so it is used to purify things. This gemstone is good to use when you don't have enough energy. It is also useful when you want to get out from stagnant period of luck. Cherry Quartz has meaning and properties that can help solving problems. This gemstone can reduce underlying fear. It can be used as an amulet to find a clue of a solution. It would give you a trigger and a chance to make a new step forward.